An understanding of the spacetime singularity in terms of its event horizon is currently attempted by physicists. Laws of physics are no longer valid. Light emitted from beyond the event horizon (Schwarzschild radius) cannot escape the singularity. There is an escape mechanism from the event horizon, however, related to quantum effects. This process is known as Hawking radiation or simply as Black Hole evaporation. 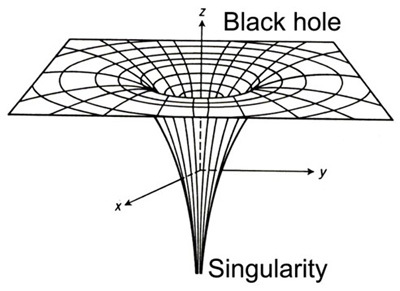 The General Relativity theory is inadequate to describe the spacetime singularity. We need a theory of quantum gravity for a better understanding of the event horizons. “What is beyond the event horizon?” is a legitimate question for physics. This entry was posted in physics and tagged Black hole, Event horizon, General relativity, Gravitation, physics, Schwarzschild radius, Spacetime. Bookmark the permalink.